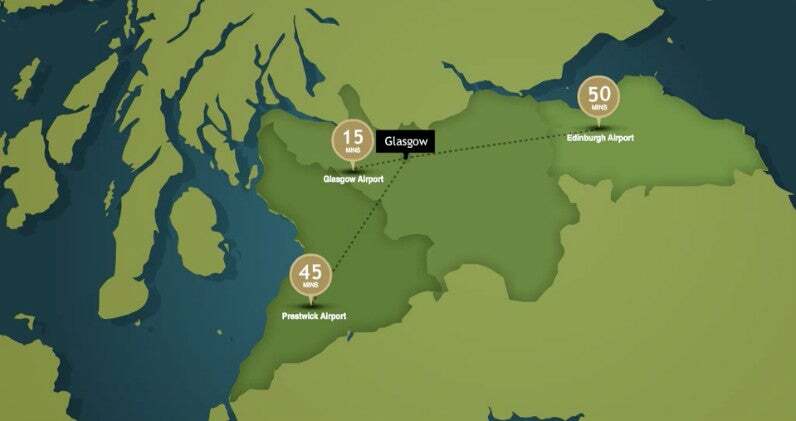 Glasgow is served by three international airports offering flights from more than 150 destinations. Glasgow Airport (GLA) serves most major international airlines and major international European cities. The airport has daily flights to/from Campbeltown, Orkney and Shetland, as well as the Inner and Outer Hebrides. There are also frequent daily services to London. The airport is 8 miles (13km) west of the city and about 20 minutes’ drive to The SSE Hydro in normal traffic. Glasgow Airport has an SPT Travel Desk, located at Domestic Arrivals (Check-in), where staff can provide you with details of buses and taxis. Information can be found online at Scotland’s public transport information website Traveline Scotland. Airport buses run from the airport to Glasgow city centre up to every 10 minutes, 24 hours a day, and take approximately 25 minutes. For more information on the 747 AirLink service, please visit the Scottish Citylink website. Glasgow Airport Taxis are located immediately outside the terminal building or can be booked by calling +44 (0) 141 889 1813. Or you can call Glasgow Taxis on +44 (0) 141 429 7070. Glasgow Prestwick has its own railway station and discounted rail travel is available from anywhere in Scotland. There are three trains per hour on weekdays and journey times to Glasgow Central are approximately 45 minutes. Alternatively it’s an easy journey to drive via the M77 or there is an early morning and late evening express bus service, the X99/X100, which takes an hour. You can book tickets here: Express Bus Service. You can get to Glasgow from the airport by bus, taxi or train. Journey times are around 30 minutes in normal traffic. Scottish Citylink provides direct bus services from Edinburgh Airport to Glasgow’s Buchanan Bus Station every 30 minutes. Alternatively you can catch a bus or taxi to Edinburgh Haymarket and then catch a train to Glasgow Queen Street station. Low level trains from nearby Glasgow Central station take you to the Exhibition Centre stop. Visit the Edinburgh Airport website to book flights.